At first sight a vast reservoir can be a daunting prospect when fly fishing. Here's how to find the trout when you are fishing the venue from the bank. Its your first visit to a trout reservoir - yet when you open the car door to be greeted by a cold wind and acres of grey water, you may wish you had stayed at home in bed. The fact is that if you haven’t done your homework first, you may as well have done. Trout are not stocked in a reservoir at the same density as they are in a small stillwater. So it’s absolutely vital to find the fish first. In days gone by, queues of anglers would form at midnight outside reservoir lodges on opening morning, such was the competition to get in the best spot. You won’t have that problem these days, but it pays to arrive as early as possible. There’s a fallacy that you have to wade out as far as possible. All this achieves is to push the fish further out. So stay on the bank for as long as possible. 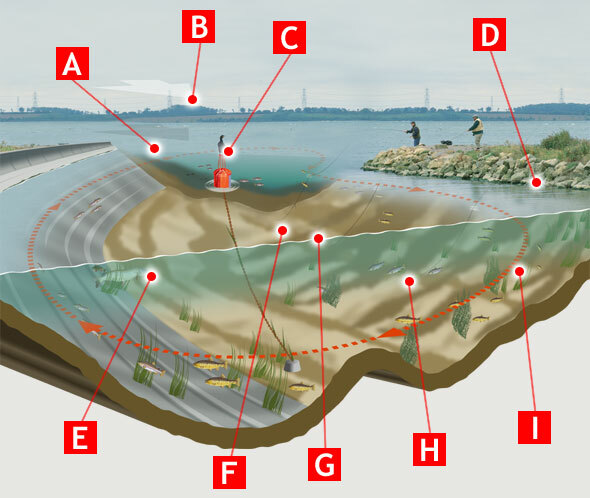 Let’s look at the typical bank features that will hold fish, and how you should tackle them. CREEK: These sheltered, narrow bays are found on most large waters. The shallow water is rich feeding area and often home to some very large rainbows and browns. WIND: Freshly stocked fish follow the wind then hold up in bays along the downwind shore. So, when casting into the wind, the trout will be closer than you think. BIRDS: Fish eating birds like cormorants betray the presence of fish shoals. Get up early, see where the birds are lined up and fish the area thoroughly. POINTS: Rocky or grass outcrops provide quick access to deep water, ideal during early season when the fish are lying deep. The nooks and crevices house food. BIG PIKE: Reservoirs also hold large pike, often well into double figures. Cast your pike flies around weedbeds in the shallows as temperatures warm up. NYMPHS: Fish nymphs and buzzers under the indicator off points and into bays. This is a deadly method during early season and often tempts better quality trout. BOOBIES: Fished on a fast sink line to deep lying trout, the buoyant Booby rises just above the weed visible to any nearby fish. Again, fish off a point into deep water. LURES: Search the depths with a glass intermediate line and black and green lure. This colour combination is successful during early season. STOCKIES: Freshly stocked rainbows will follow a circular route round a bay until the shoal eventually splits up after several days of pressure. THESE are the most popular of early-season reservoir features, because they always hold fish. The only variable is how far out they are from the bank. Concrete, or boulder, dams will extend underwater, attracting all types of trout food in the nooks and crevices. The access to deeper water gives the fresh stockies a feeling of security. You will find that the shoals swim up and down the dam, giving their presence away as several anglers in a line suddenly all hook a fish. It can be a bit like mackerel fishing. But instead of trying to chase them, stay in your spot and eventually the fish will come to you. line or fish a Booby on a sinking line like a Di-5 or Di-7. Both methods will work from the start. If the wind is blowing into the dam, expect the fish to come in close although casting will be more difficult and you may have to shorten your leader. If the wind is on your back, casting will be easier, although the fish will now be further out. Best conditions of all will be a side wind when you can let your fly drift round in an arc. TIP: WHEN CASTING FROM A DAM WALL, WATCH THAT YOUR HOOK POINT DOESN’T GET TURNED OVER, OR EVEN SNAPPED OFF, BY HITTING THE TOP OF THE DAM ON THE BACK CAST. AT the start of the season, you can expect the water at most reservoirs (excluding drought-stricken Bewl) to be at top level after a winter of pumping from the rivers. This means deeper water close to the bank. Although spaces may be limited, getting on the end of harbour wall or jetty will give easy access to deep water. Again, all methods should work but a varnished Black buzzer fished deep under an indicator can be deadly under these conditions. Fish one Buzzer close to the bottom. Fish the second nymph, usually smaller and maybe a different colour, on a dropper closer to the surface. TIP: IF CORMORANTS ARE WORKING THE WATER, THE STOCKIES WON’T BE FAR AWAY. THERE is always intense competition to bag pole position on the end of a point. This is because you can fish your flies across the wind, or with the wind behind you; as well as accessing deeper water. Where two banks meet, silt can build up creating a shallow spit that can extend more than 30 yards into the water. This shallow shelf creates a haven for food and a drop-off bolt hole should the trout sense any hint of danger. The temptation on a point is to wade further and further out, which can be dangerous if the bottom is soft under foot. Some points — Old Hall at Rutland is a good example — are not suitable for wading because of the depth, and will fish just as well from the bank. Here boulders have been placed to protect the bank from erosion and provide handy perches from which to cast. Catch a cross wind on this type of point, and trout are almost guaranteed, Black Buzzers on a long leader working as well as anything. The area where the shallow water drops into the depths is always worth exploring with a small lure like a Damsel goldhead on a clear intermediate line. TIP: AVOID HARD CLAY OR ROCKY BOTTOMS. ANY EARLYSEASON LARVAE WILL HATCH FROM THE SHALLOW SILT BEDS. IF your thoughts are on catching an overwintered fish rather than a fresh stockie, then you may have to go hunting. These larger fish will either be well out in open water, where you will need a boat to find them, or close to the shore in shallow protected areas. If your chosen reservoir has a creek, then start to fish at the very shallow end, particularly if it has been recently flooded. Fry feeding may still be taking place and a lure like a Minkie is the best fly to try. Besides grown-on rainbows, you may hook an oversize brown trout here. If any weedbeds are left over from summer, concentrate around these. TIP: CAST AS CLOSE AS YOU CAN TO ANY OVERHANGING BRANCHES OR VEGETATION. BIG FISH MAY BE LURKING BENEATH. YOU may end up in a bay through no fault of your own. But don’t despair, fish will come in at some time during the day. Your best plan of attack here is to use Buzzers under an indicator cast out as far as you can. Bays really come into their own later in the season when the buzzers start to hatch in earnest. TIP: TRY TO GET A POSITION ON THE SIDE OF THE BAY AS CLOSE TO OPEN WATER AS POSSIBLE. RODS: Go for an 8wt fast-actioned rod. 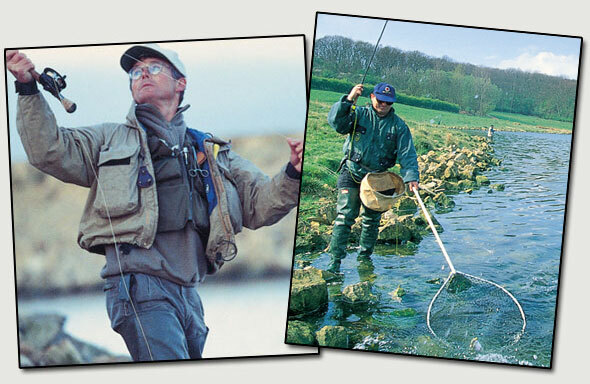 This will give you maximum distance casting opportunities as well as coping with any wind. If you buy a ten footer, then you can use that rod in the boat as well. 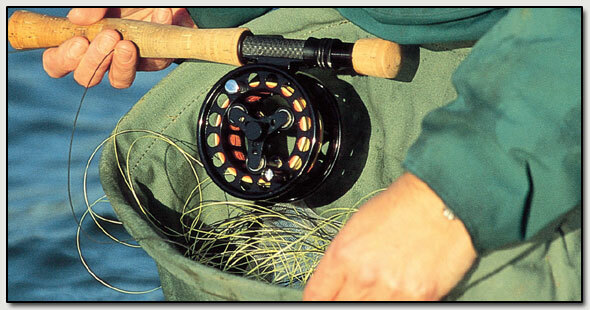 REELS: You will need a wide arbour reel with at least two spare spools to carry your extra lines. FLY LINES: Besides your WF floater, you will need a clear intermediate and a fast sinker like a Di-7. Many anglers now prefer to use one of the Airflo 40 Plus series from the bank to gain that extra distance. LEADERS: Don’t worry about too delicate presentation at this time of the year. Ten to 12lb fluorocarbon is ideal for lures; 8lb for nymphs. LINE TRAY: If you are wading, then it is a good idea to use a line tray around your waist to prevent the fly line sinking into the water and coiling around bits of weed. LANDING NET: Go for a net with a spiked handle. Then you can stick this into the bottom for when you need it. It also marks the spot that you are fishing. CLOTHING: Standing for long periods up to your thighs in water requires the right thermal clothing. Start with thermal underwear and long johns. Then wear a modern lightweight rollneck top, plus a fleece and a wading jacket. Neoprene waders are the best bet during early season but breathables can be used when the water warms up a bit. YOU won’t need a vast selection of flies for the start of the season. The fish have not seen many so won’t be too fussy. For lures, use black and green, white and green and orange — preferably with Fritz and marabou tails. Fish the lures slowly with a figure of eight retrieve on a slime, slow-sinking line or sink-tip. Successful lures would be Cat’s Whisker, Orange Blob, Orange Fritz and a marabou-tailed Damsel. Try the nymphs during the warmer part of the day between 11.30am and 2.30pm, either fished static or beneath an indicator. Productive nymphs are likely to be Black Buzzer, Diawl Bach and Cruncher.